There are many different types of Caskets. Caskets are made as an everlasting receptacle for the resting human body. They come in a variety of materials and interiors. Bronze: 48oz Bronze Caskets come with velvet interiors. Copper: 32 oz Copper Caskets also come with velvet interiors. Metal: The most popular models come in metal. 16 gauge a thick, heavy metal. 18 gauge, the most popular. 19 and 20 gauges are the thinnest and most economical. Wood: Caskets come in a Varity of woods. Mahogany and Cherry is the top of the line. Oak, Maple and poplar make up the body of the line. Pressboard and Fiberboard are the most economical. Hardware: defined as the handle and stanchions, where the handle meets the side. Headpanel: The part of the top that is opened for viewing. Interiors: Colors are provided to compliment the exterior color. 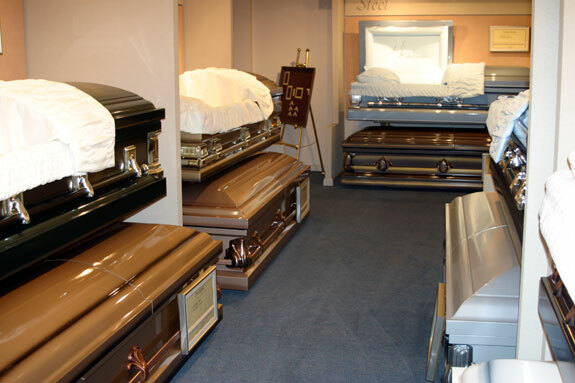 Many Caskets come in an assortment of interior colors. Interiors come in Crepe or Velvet. Color: All the gauges come in a variety of colors and shades. Most come in a single color base and a second color of highlight. Religion: Some caskets provide a religious symbol on the hardware or corners. They may also be found in the headpanel inside the open lid. Custom Caskets are available: Caskets are available with the symbols emblazoned on the exterior top. Such as the universal Military logos and College logos. The Firefighter Service and Police Service were the first symbols available. Some Sports Teams are also on board.